R.F. Scott and the boys, en route to the South Pole. Have you ever wanted to go on an adventure that tests you so thoroughly you don’t know if you’ll come through it intact? That type of experience never puts us in a cheery mood. We would much rather watch these types of undertakings from the comfort of our living room. 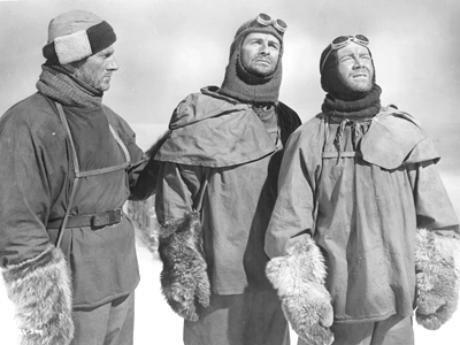 For example, look at the 1948 British adventure flick, Scott of the Antarctic, a grim re-enactment of Robert Falcon Scott’s 1911-12 expedition to the South Pole. Scott, a former naval officer, is consumed with being the first person to reach the South Pole. This is a tense, tense film that makes you feel utter despair at times. We’re not joking when we say you’ll be reaching for your sweater when watching this; the sound of the Antarctic wind is that chilling. As you might imagine, Scott and his team are up against it on all sides. Not only must they contend with the weather and inhospitable landscape, they’re racing against another team! Can you just imagine? You finally raise enough cash to get to the South Pole and suddenly someone else is threatening to beat you to it. Scott’s competitor is famed Norwegian explorer Roald Amundsen, a person who is never shown in the film but is an ever-present monkey on Scott’s back. Much of the movie was filmed outside, in the desolate snow of Norway. The actors pull sleds through deep snow, slide on ice and pour tea inside cramped tents. No scenes shot in front of a green screen here; this film-making is about authentic as it gets. Yikes! Now that we’ve almost frightened you away, let us point out that the acting in the movie is pitch-perfect. Expedition leader Scott is portrayed by the great John Mills who, as it turns out, has a passing resemblance to the real Scott. Then there’s James Robert Justice, who plays injured team member Evans. In one scene, there is a close-up of Evans against the bitter white snow: his face reveals his determination despite his physical pain; then the realization that he is unable keep up with the others; and, finally, the knowledge that he’s going to die, here, at the bottom of the world. Plus! We have the legendary Director of Photography, Jack Cardiff. He has captured some amazing images: penguins squirting out of the water and onto the ice; dancing green northern lights; icebergs resting majestically in the ocean; sled dogs breaking out of drifts of snow after a night’s sleep. Scott of the Antarctic is a haunting, well-acted, superbly filmed movie that was the #4 box-office draw in Britain in 1948. In our opinion, it is one of the best adventure movies made, ever. If you are looking for a rugged Antarctic adventure, we suggest you first try Scott of the Antarctic. It may save you a bit of plane fare. Scott of the Antarctic: starring John Mills, Harold Warrender, Diana Churchill. Written by Ivor Montagu, Walter Meade, Mary Haley Bell. Directed by Charles Frend. Ealing Studios, Colour, 1948, 110 mins. I’ve never seen this and really need to. 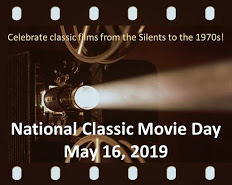 I really like the way the Brits did “stiff upper lip” adventure or war films; everything’s much less sensationalized and melodramatic than their American counterparts. Thanks for the very interesting review! I love a good adventure but I don’t like to be cold at all! I barely ever wear socks but I think I’ll have to hunt this film down. The way you’ve described it here has certainly ‘peaked’ my curiosity! Dum Dun . Love the Antarctic gear of the time too. It certainly sounds like Frend put something great onto film. Ah, you’ll need your socks for this one, Page. You have a great weekend too! This sounds like a great adventure movie. Just the kind of thing I am always looking for. Thanks for the review, I’ll be watching it soon! It’s terrific, and really well done! Just wanted to let you know that I bought this on Amazon, and I’ll be watching it later this week! Thanks again for the recommendation! I’m shivering already! :o) Have to check if our library has this one. Great review! It’s worth it if you’re able to find it. Make sure you have a cup of hot cocoa or tea! Ruth, while SCOTT OF THE ANTARCTIC doesn’t exactly feel like the Feel-Good Movie of 1948, it sure sounds like a gripping movie experience. Heck, you had me at “John Mills” and “James Robertson Justice”! Your review was superb, and I’ll keep an eye for this true-life survival tale! LOL! Thanks, Dorian. It really is a terrific film. Wow!! Awesome review! It totally made me want to see this movie RIGHT now 🙂 I am definitely going to see where I can find it! Thanks for all the new information!!! Terrific blog! Nice review. I’ve always found that snowy landscapes do make for a tense atmosphere on film. Do they ever! Thanks for the follow & for dropping by. John Mills and Jack Cardiff? I’m in! LOL!! You’re right – what more do you need? Let me know what you think, Sarah.